Home How Was The Show? Jeff Beck: Guitar God, Piercing the Soul Live In St. Louis. Jeff Beck performing live at The Hollywood Casino Amphitheater on July 28th, 2018. Jeff Beck at the Hollywood Casino Amphitheater in Maryland Heights, Missouri, July 28th. Running up the large backside of a hill, I hear metallic echoes clanging overhead. Being a man of good timing, I know that this must be the start of Jeff Beck’s set. A newfound vigor charges through my cells as I steam toward the awaiting valley beyond this obstructing knoll. “Pull it” bellows from the stage, from Jeff’s latest album Loud Hailer. That term being a Brit expression for what we may call a megaphone. It’s symbolic as a means to an end: Yelling. Befitting this is how it roars like an angry robot demanding penance. This is a wonderful day to die, it might say. The Mahavishnu Orchestra share a special history with Jeff Beck, as Billy Cobham was in Mahavishnu and John McLaughlin used to tour with Jeff. He even gave Jeff a prized Stratocaster. These little details are so important to the story, and “You know, You know” by the Mahavishnu Orchestra was also covered by Beck and his band on this special night. It is a delicate piece with a huge dynamic range; from whispering silence between blaring outburst, this is the music of the soul. Vocalist Jimmy Hall came on stage to belt out a few songs and those numbers were solid as a rock. The Sam Cooke classic “A Change Is Gonna Come” was a standout. After a few songs, even another new one, Jeff told the audience dryly, “This is my version of this song. So that’s that” and proceeded to bring down the house with a perfect rendition of “Little Wing” by Jimi Hendrix. From a guitarist perspective, what more could you possibly ask from the man on stage? He is a wise wizard with many a spell. Like a kaleidoscope, he shifts his fractal image from song to song. The set ebbs and flows, churning into the heavy “Big Block” with very meaty riffs. Only to settle down once again and pull on our heartstrings with the classic “Because We’ve Ended As Lovers”. Which was originally written by Syreeta Wright. Beck’s version is up there with any legendary blues-drenched guitar-piece. He wails, and it could bring tears to your eyes. It’s rare to find a musician who is truly virtuoso and capable of expressing so many emotions through an instrument, but these qualities exist clearly in Jeff Beck. The crowd screamed for him and he seemed to be a bit overcome by the love. “It’s nice to be appreciated” he sheepishly said to the thousands of fans begging him on. A career like his deserves and commands this kind of respect, and it is well earned. He closed out the set with “Superstition” by Stevie Wonder; which is a song Jeff actually helped write. The guitar riff is iconic and sounded better than ever. Funk-driven disco-rock that sweeps into the eternally catchy vocal hooks. Perfection. A staple of Jeff Beck live performances is his rendition of “A Day In The Life” by the Beatles. Again, words cannot express, but an artist of this caliber that has the ability to sing with his instrument is truly something to behold. Something to cherish. The whole crowd knows the words to this classic song, and it is a joy to hear it performed in this uniquity. The orchestral and slithering wind-up of the song culminates in that thundering noise we are so ready for. A pause and the classic and huge E chord rings out to close the song. A Jeff Buckley tribute follows: “Corpus Christi”. Delicate and heartfelt. Yes, you do, Jeff, yes you do. 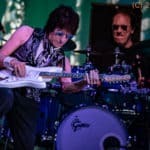 View Jeff Beck concert photos from his performance at The Hollywood Casino Amphitheater in St. Louis on July 28th. Previous PostSeptember is the Motherlode of Festivals. Next PostNothing More: Perseverance Pays.